The Group of Monuments at Mahabalipuram, in Tamil Nadu, about 58 km from Chennai, were built by the Pallavakings in the 7th and 8th centuries. The town has gained prominence under the rule of Mamalla. These monuments have been carved out of rock along the Coromandel coast. The temple town has approximately forty monuments, including the largest open-air bas-relief in the world. It was inscribed under the UNESCO World Heritage list in 1984 as a cultural heritage under categories (i)(ii)(iii)(vi). The monuments inscribed are the Ratha Temples: Temples in the form of chariots, Mandapas. 11 Cave sanctuaries covered with bas-reliefs, rock relief of Descent of the Ganges, which is the largest open air Rock relief also known as Arjuna's Penance or Bhagiratha's Penance. The tourist town of Hampi in Karnataka’s home to the erstwhile Vijayanagar empire, finds itself in second place in the New York Time's list of ‘52 Places to visit in 2019’. Hampi is the only Indian destination, which has managed to secure a place in the list. Please read the blog to know more informations about the importance of Hampi in Karnataka state and how to plan a tour program including Hampi in India and best hotels to choose. 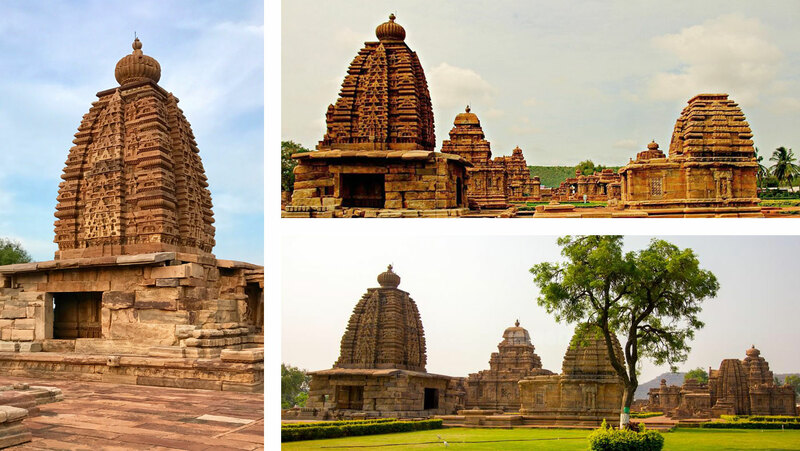 The Group of monuments in Pattadakaldesignated under UNESCO World Heritage List, in 1987, cover a remarkable series of nine Hindu temples, as well as a Jainsanctuary in northern Karnataka. In this group of temples, the Virupaksha Temple, built c. 740 by Queen Lokamahadevi to commemorate her husband's (King Vikramaditya II) victory over the Pallava kings from the south, is considered the most outstanding architectural edifice (This is different from the Virupaksha Temple at Hampi.) These are a remarkable combination of temples built by the Chalukya Dynasty in the 6th to the 8th century at Aihole, Badamiand Pattadakal, the latter city was known as the "Crown Rubies". The temples represent a remarkable fusion of the architectural features of northern (Nagara) and southern (Dravida) India. Pattadakal is considered a Hindu holy city and within the heritage complex are eight temples dedicated to Shiva, a ninth shaivitesanctuary called the Papanatha Temple, and a Jain Narayana temple. 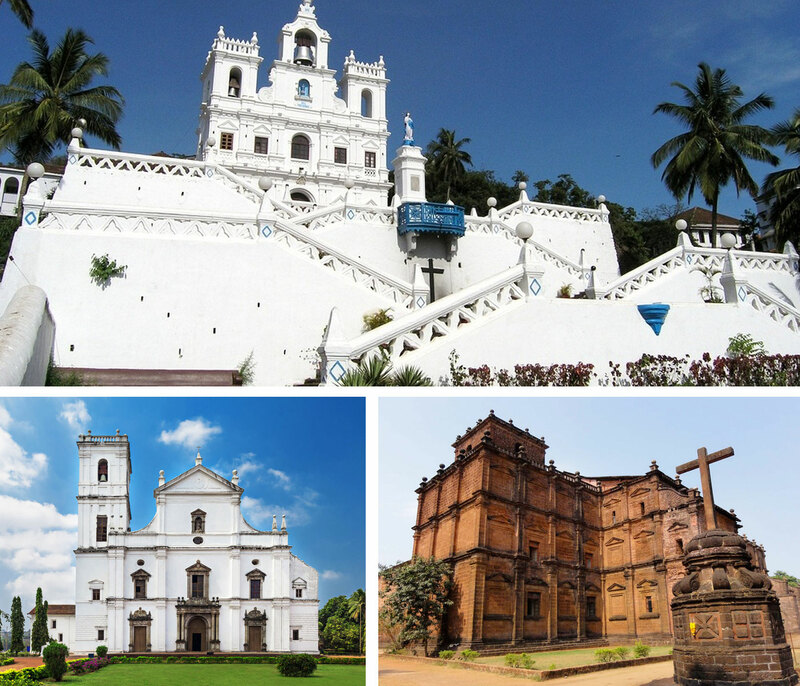 Churches and Convents of Goa are monuments inscribed by UNESCO under the World Heritage List in 1986 as cultural property, under criteria (ii),(iv) and (vi), which were built by the Portuguese colonial rulers of Goa between 16th and 18th centuries. These monuments are mainly in the former capital of Velha Goa. Velha Goa is also known Goem, PornemGõy, AdlemGõi, Old Goa or SaibachemGõi, where Saib or GoenchoSaib refers to Saint Francis Xavier. The most significant of these monuments is the Basilica of Bom Jesus, which enshrines the tomb containing the relics of St. Francis Xavier. These monuments of Goa, known as the "Rome of the Orient," were established by different Catholic religious orders, from 25 November 1510 onwards. There were originally 60 churches of which some of the surviving monuments in the city of Velha Goa are the Saint Catherine's Chapel (where one of the first, probably only besides the Angediva Island, Latin rite mass in Asia, was held on Saint Catherine's feast day, 25 November 1510), the Church and Convent of Saint Francis of Assisi, the SéCatedral de Santa Catarina dedicated to Saint Catherine of Alexandria, the Jesuit BoreaJezuchiBajilika or Basílica do Bom Jesus, Igreja de São Francisco de Assis (also known as AsisacheaSanvFransiskachiIgorz), the Theatine Igreja da Divina Providência (São Caetano) (also known as San KaitanachiIgorz or the church of Saint Cajetan and its seminary (resembles Basilica Papale di San Pietro in Vaticano), Igreja de NossaSenhora do Rosário (also known as RuzaiSaibinnichiIgorz (Church of Our Lady of the Rosary)) and Igreja de Santo Agostinho (also known as SanvAgustineachiIgorz (Church of Saint Augustine) (only the belfry stands today and some graves, including the Georgian Orthodox Church Saint, Saint Ketevan, who was also a queen). These monuments were forerunners in establishing an ensemble of the Manueline, Mannerist and Baroque art forms in the Asian region. The monuments are built in laterites and walls plastered with limestone mortar mixed with broken shells. For this reason, the monuments need constant maintenance to prevent deterioration due to monsoon climatic conditions, and thus keep them in good shape. The Great Living Chola Temples, built by kings of the Chola Empire stretched over all of Tamil Nadu. This cultural heritage site includes three great temples of 11th and 12th centuries namely, the Brihadisvara Temple at Thanjavur, the Brihadisvara Temple at Gangaikondacholisvaram and the Airavatesvara Temple at DarasuramThe Temple of Gangaikondacholisvaram, built by Rajendra I, was completed in 1035. Its 53 metres (174 ft) vimana (sanctum tower) has recessed corners and a graceful upward curving movement, contrasting with the straight and severe tower at Thanjavur. The Airavatesvara temple complex, built by Rajaraja II, at Darasuram features a 24 metres (79 ft) vimana and a stone image of Shiva.The temples testify to the brilliant achievements of the Chola in architecture, sculpture, painting and bronze casting. The site was inscribed under UNESCO World Heritage List in 1987 as Cultural heritage under criteria (ii) and (iii). Buddhist Monuments at Sanchi, located 45 kilometres (28 mi) from Bhopal in the Indian state of Madhya Pradesh are a group of Buddhist monuments dated between 200 BC and 100 BC. The site, however, has been conjectured to have been developed in the 3rd century BC, when Emperor Ashokaof the Mauryan Empire ruled. The principal monument is Stupa 1 dated to the 2nd century and 1st century BC. These Buddhist sanctuaries were active Buddhist religious monuments, which flourished until the 12th century. The sanctuary has a plethora of monolithic pillars, palaces, temples and monasteries in different status of preservation. It was inscribed as a World Heritage site by UNESCO on January 24, 1989 for its unique cultural importance. It was discovered only in 1818 in a deserted state of preservation. Archaeological excavations undertaken thereafter revealed 50 unique monuments. 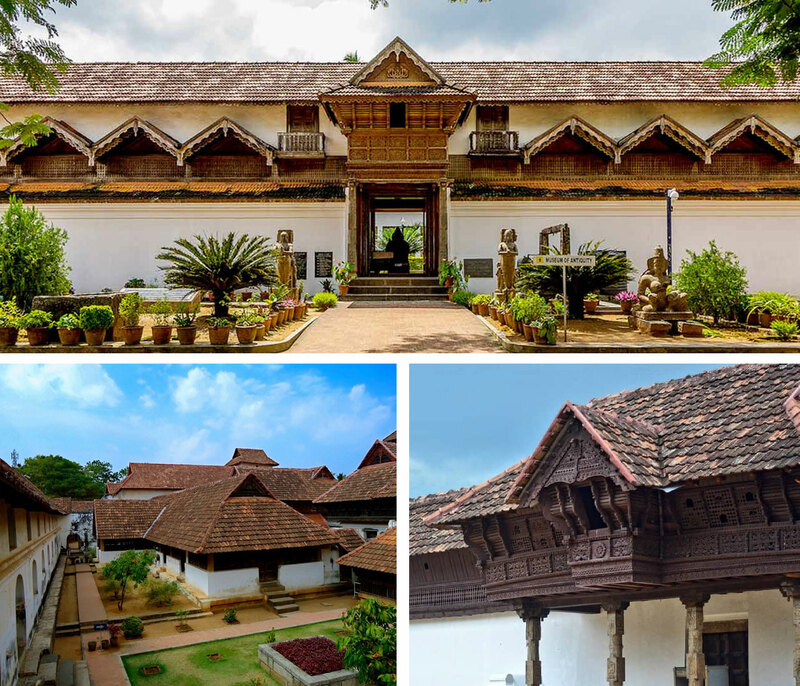 Padmanabhapuram Palaceis located in the Kanyakumari district, Tamil Nadu but it is owned and controlled by Kerala Govt. The Sri Ranganathaswamy Temple or Thiruvarangam is a Hindu temple dedicated to Ranganatha, a reclining form of the Hindu deityVishnu, located in Srirangam, Tiruchirapalli, Tamil Nadu, India. Constructed in the Dravidian Architecture, this temple is glorified by Alvars in their DivyaPrabhanda and is one among the 108 DivyaDesams dedicated to Vishnu. It is one of the most illustrious Vaishnava temples in South India rich in legend and history. The temple has played an important role in Vaishnavism history starting with the 11th-century career of Ramanuja and his predecessors Nathamuni and Yamunacharya in Srirangam.ts location, on an island between the Kollidam and Kaveri rivers, has rendered it vulnerable to flooding as well as the rampaging of invading armies which repeatedly commandeered the site for military encampment. [ The temple was looted and destroyed by the Delhi Sultanate armies in a broad plunder raid on various cities of the Pandyan kingdom in early 14th century. The temple was rebuilt in late 14th century,the site fortified and expanded with many more gopurams in the 16th and 17th centuries. It was one of the hubs of early Bhakti movement with a devotional singing and dance tradition, but this tradition stopped during the 14th century and was revived in a limited way much later. Chettinad is a region located mainly in the Sivaganga district of Pandya Nadu and has a small portion extending into the PudukottaiDistrictof Chola Nadu in Tamil Nadu, India. You will be picked up from Bangalore to drive to Mysore (150 Kms/ 03 Hrs). Enroute visit Srirangapatanam and Somnathpur. .
Srirangapatana - The history of this town dates back to the 9th century, when it was founded by the rulers of the Ganga dynasty. However, the destination came into the limelight during the reign of the Vijayanagara Empire. The rise of the Wodeyar kings marked the downfall of the Vijayanagara Empire. Somnathpur - is a tiny village which is situated in close to the Karnataka-Kerala border. The hamlet is located on the banks of river Cauvery and is named after its founder Somnath the chief commander of the Hoysala army. Somnathpur is a town where one can interact with nature and is an ideal picnic spot with family. The temple of Somnathpur is a typical example for Hoysala architecture. The stone carving which is inside the temple is an awesome example of stone carving. Discuss on Arrival with Guide the 5 days activites of Dusera Festivel customise itinerary and organise it accordingly. After breakfast from the hotel, drive to Chamundi Hills to pay your obeisance to Goddess Chamundeshwari. On the way back to city you will see Statue of Mahishasura and Nandi. Visit the Mysore Zoo, one of the oldest and well maintained zoo in India. And also visit Karanji Lake, a picturesque lake located at the footsteps of Chamundi Hills. And later visit Jaganmohana Palace Art Gallery. After breakfast visit Ranganathittu Bird Sanctuary, also known as PakshiKashi of Karnataka, is a bird sanctuary in the Mandya District of the state of Karnataka in India. It is the largest bird sanctuary in the state, only 40 acres in area, and comprises six islets on the banks of the Kaveri river. Later drive to KRS - Brindavan Gardens a show garden that has botanical park with fountains as well as a musical fountain. Full day free for your own activities. Enjoying Dussehra Festival. 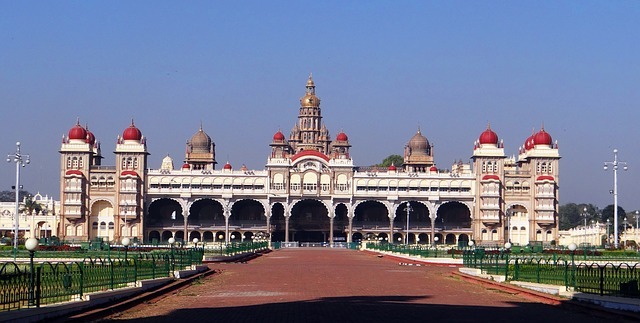 Stay overnight at Mysore. Hoysaleshwara Temple: Built during the reign of Hoysala king, Vishnuvardhana, this 12th Century temple is dedicated to Lord Shiva. Known for its intricate engravings and sculptures, this star shaped temple is actually a combination of two temples; Hoysaleshwara and Shantaleshwara, said to be dedicated to Vishnuvardhana and his wife Shantala, respectively. This iconic temple is a testimony to awe-inspiring workmanship and is not to be missed! Kedareshwara Temple: Located just 400 metres from the Hoysaleshwara temple, this temple is dedicated to Shiva in the form of Kedareshwar. Built in the 12th Century, the engravings in this temple are stunning. Do pay attention to the carving and importance given to the bhava in accordance to asthra (weapons) for numerous the Hindu Gods like the Shiva, Vishnu, Brahma, Lakshmi, Saraswathi, Krishna, Varaha, Ganesha, adorning the temple. Apart from the ornate Hindu temples, the area also houses some of the most spectacular and equally rich in art Jain basadi/basti or shrines. Parshvanatha Basti: Dedicated to the twenty third tirthankara, Parshva, the basti was built by Boppana, son of Gangaraja, a minister in Vishnuvardhana’s court. The shrine houses 18 ft tall statue of the tirthankara, 32 pillared pavilion. ShantinathaBasti: The shrine dedicated to the sixteenth tirthankara, Shantinatha, is now being proposed as a UNESCO World Heritage Site. AdinathaBasti: Housing an idol of Adinatha and Saraswati, this 12th Century Jain temple is comparatively smaller than the other two bastis. Chennakeshava or Keshava temple: Considered as the finest examples of Hoysala architecture. dedicated to Lord Vijayanarayana, one of the 24 incarnations of Lord Vishnu. The temple was built to commemorate Hoysala victory over the Chola, under the leadership of King Vishnuvardhana. The exquisite carvings on the temple depict the scenes from the Upanishads, Mahabharata and Ramayana. KappeChennigaraya: Situated to the south of the Chennakeshava temple, this temple contains a 6.5ft tall sculpture of Chennakeshana. This temple was consecrated by Shantala, senior queen a of the Hoysala king Vishnuvardhana. Karthika Deepotsava Stambha or the Gravity Pillar: 42 feet tall lamp post, the KarthikaDeepotsavaStambha, was installed by a commander of the Vijaynagara ruler, Krishnadevraya demarcating the emergence of the Vijaynagaraempire as the Hoysalaempire was on a decline. It is popularly referred to as Gravity Pillar as it appears to be standing on its own dead weight. Vishnu Samudra: Built during the reign of Narasimharaya, this well was made to provide access to sacred water for holy purposes to the devotees. • UgraNarasimha / Lakshmi Narasimha Statue - At a distance of 800 m from Hampi Bus Stand, UgraNarasimha Temple is located south of Sri Krishna Temple in Hampi. Sri Krishna Temple / Bala Krishna Temple - At a distance of 500 m from Hampi Bus Stand, Sri Krishna temple is situated on the Hampi main road. • Virupaksha Temple - At a distance of 400 m from Hampi Bus Stand, Sri Virupaksha temple, the most famous and important temple of Hampi, is located at the western end of Hampi Bazaar in Hampi. Hampi Bazaar - Hampi Bazaar is located beside the Hampi Bus Stand and located in front of the Virupaksha temple. It is also known as Virupaksha Bazaar. About a kilometer long, the eastern side of the bazaar ends at the foothill of Matanga Hill. Achyutharaya Temple - At a distance of 1 km from Hampi Bus Stand & 500 m from Hampi Bazaar, Achyutharaya temple is located between the Gandhamadana hill and Matanga hill. It is one of the last grand creations of the Vijayanagara dynasty before the fall of the empire. King's Balance - At a distance of 10 km from Hampi Bus Stand (or 1.5 km by walk) and 6 km from Kamalapur Bus Stand, King's Balance is located southwest of Vittala Temple, at the end of the KampaBhupa's Path in Hampi. It is also called as Tula Bhara or Tula Purushadana. This is located near Vittala Temple. Vittala Temple / Vijaya Vittala Temple - At a distance of 9 km (or 2.3 km by walk) from Hampi Bus Stand and 5.5 km from Kamalapura Bus Stand, Vittala Temple is an ancient monument located on the southern bank of the Tungabhadra River. It is one of the largest and the most famous structures in Hampi. This temple is famous for Stone Chariot and Musical Pillars and is among prime place to visit on a Hampi trip. Pattabhirama Temple - At a distance of 1.2 km from Kamalapura Bus Stand and 5 km from Hampi, Pattabhirama Temple is situated near ASI museum in Kamalapura. Along with the Virupaksha and Vittala temples, the Pattabhirama temple represents the creative temple-building ventures of the Vijayanagara rulers. Archeological Museum - At a distance of 300 m from Kamalapur Bus Stand and 4 km from Hampi Bus Stand, The Archaeological Museum at Kamalapur is dedicated to the ruins of Hampi and surrounding places. Malyavanta Raghunathaswamy Temple - At a distance of 2.5 km from Kamalapura Bus Stand and 6 km from Hampi, Sri Malyavanta Raghunatha swamy temple is located atop the Malyavanta Hill. This temple is dedicated to Lord Rama. Queen's Bath - At a distance of 1 km from Kamalapur Bus Stand and 3 km from Hampi Bus Stand, Queen's Bath is located close at the entrance of the Royal Enclosure in Hampi. Mahanavami Dibba / Dasara Dibba - At a distance of 3.5 km from Hampi Bus Stand, Mahanavami Dibba or The House of Victory is a beautiful stone platform situated inside the Royal Enclosure of Hampi. It is also known as Dasara Dibba and is one of the most impressive structures in Hampi. Stepped Tank - Travel Tips: At a distance of 100m from Mahanavami Dibba and 3.5 km from Hampi Bus Stand, The Stepped tank is located in Durbar Area in Royal enclosure of Hampi. This famous Stepped Tank was excavated by Archeological Survey of India during 1980-1983. This tank is very ornate and one of the most beautiful monuments of Hampi. Duration of visit: 15 Mins, Timings: 6 AM - 6 PM. Royal Enclosure - At a distance of 3.5 km from Hampi Bus Stand and 2 km from Kamalapur Bus Stand, The Royal Enclosure in Hampi is a huge fortified area that was once the heart of the Vijayanagara Empire. • King's Audience Hall / Durbar Hall - At a distance of 3.5 km from Hampi Bus Stand and 2 km from Kamalapur Bus Stand, The King's Audience hall, also known as Durbar Hall is located inside the Royal Enclosure at Hampi. It is a ruined structure whose remnants can be spotted on the western side of the MahanavamiDibba or DasaraDibba. Lotus Mahal - At a distance of 500 m from Hazara Rama Temple, 3.5 km from Hampi Bus Stand and 2 km from Kamalapur Bus Stand, Lotus Mahal is situated within Zenana Enclosure, a secluded area reserved for the royal ladies of the Vijayanagara Empire. This is also known as ChitraganiMahal and Kamal Mahal. Stay overnight at Hotel Burton Boatyard - Sea view Room. Morning after breakfast proceeds to Trivandrum. 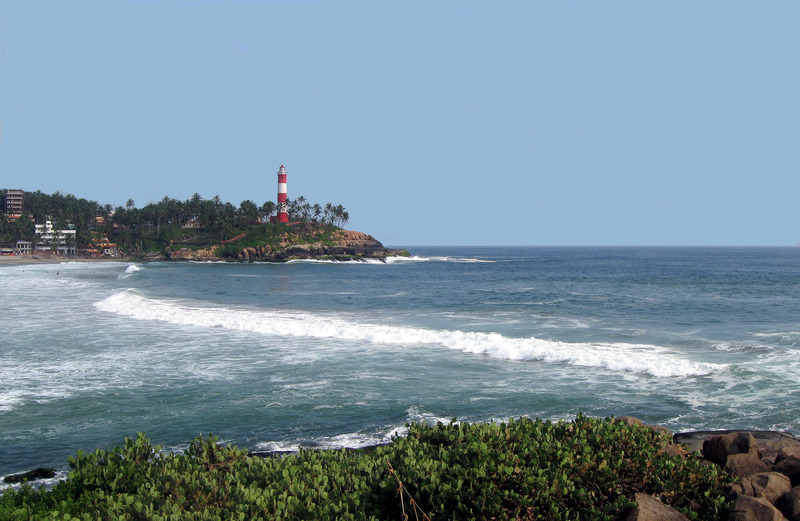 Visit the famous Sri Padmanabha Swami Temple, KuthiraMalika Palace, The Royal Museum, Napier Museum and Zoo etc .Evening back at Kovalam. Free at Leisure on the beach. Overnight stay at Kovalam. TheLeela -Beach View Superior Room. Morning after breakfast from the hotel and drive towards Kanyakumari the southern tip of Indian Sub continent and an important destination for pilgrim as well as leisure travelers.on the way visiting the Padmanabhapuram Palace &Sucheendram Temple. Visit the famous Vivekananda rock which is situated in the sea and the statue of Thiruvalluvar on the rock. Enjoy an ever memorable Sunset from there as it’s the point where Arabian Sea, Indian Ocean and Bay of Bengal are joining together. Evening return back to Kovalam. Overnight stay at Kovalam.Evening watch the most beautiful Sunset of Kanyakumari.Overnight stay at the Sparsa Hotel - Deluxe Room. After breakfast transfer to Rameshwaram. After Lunch reach to Rameshwaram. Rameshwaram is an island of Lord Rama's temple at Tamil Nadiu. Transfer to Hotel. The presiding deity is the Linga of Sri RamanathaSwamy, which happens to be one of the twelve Jyotirlingas of India. Visit to 2 Famous Bridges. Rameshwaram is also popularly referred to as the 'Benaras of the south'. Overnight stay will be Rameshwaram Hotel. Stay overnight at Hyatt Palace - Kings Room. After Breakfast check out from the hotel and Proceed to Madurai. Day at leisure & stay overnight at Heritage Madurai - Luxury Villa. After breakfast proceed for sightseeing of Madurai- visit ThirumalaiNayak Palace, Meenakshi Temple, AlagarKoil and GandhiMuseum. Overnight stay at the Hotel in Madurai. Overnight at Heritage Madurai - Luxury Villa. After breakfast leave for Trichy. It is also called Trichurapalli. The place is one of the most sacred towns of south India. City tour includes visiting Rock fort and its temple at a height of over 23mts and also visit Ranganath temple at Srirangam, Jambukeshwar Temple, St John’s Church, Vayalur, ThiruErumbur and Thiruvellarai. After sightseeing proceed to Tanjore.Overnight at Ideal River View Room - Garden Facing Room. 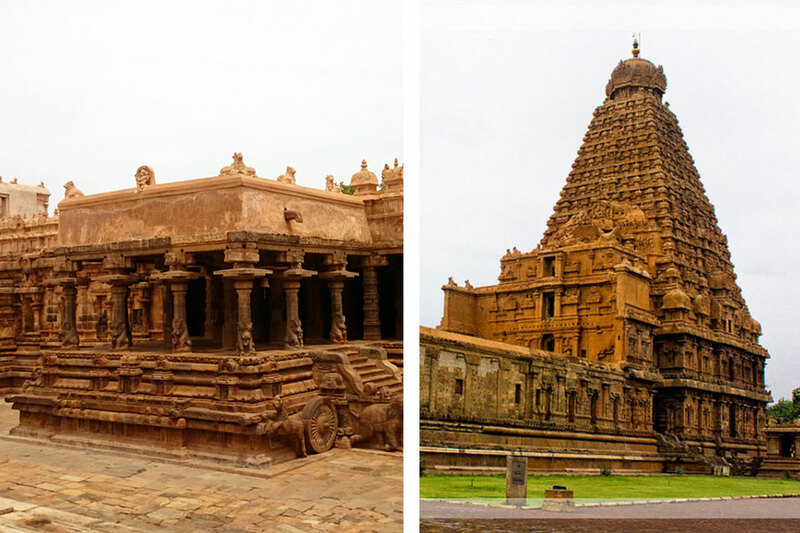 Morning after breakfast sightseeing tour of Thanjavur, visit Brihadeeswarar Temple. Brihadeeswarar Temple (World Heritage Site), built in 10th century is the grandest architectural achievement of the Chola era and after that Visit Thanjavur Palace, Airavateswara Temple, Poompuhar Art Gallery ,GagaikondaCholapuram, Great Living Chola Temples, AdiKumbeshwarar Temple. Stay overnight at Ideal River View Room - Garden Facing Room. 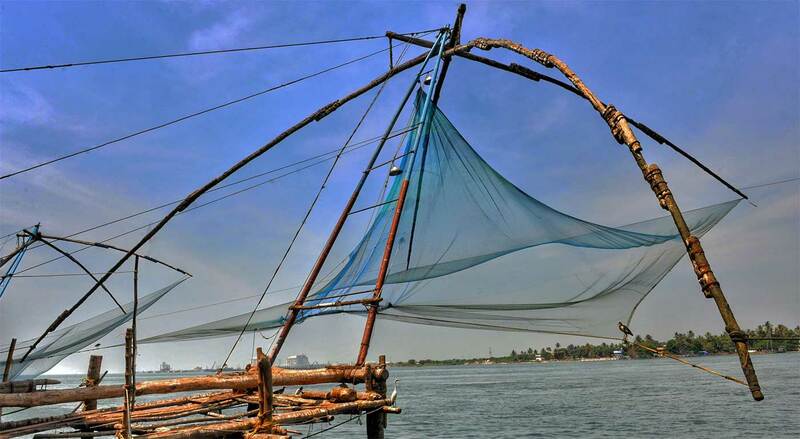 Pondicherry or Puducherry is one of the Indian union territory and the city is the largest in Puducherry. The capital city also known as Pondy has the monumnents of four Dutch, Portuguese, British and French colonial era. Pondicherry is a popular tourist destination in South India and has many colonial buildings, churches, statues and temples such as Raj Niwas, Auro Beach, Gingee Fort, White Town, Science Centre and Planetarium,Bharati Government Park, Panjavadi Temple, Pondicherry Museum. Start your day with the blessing of Manakula Vinayagar Temple, Dedicated to the god Ganesa. Visit the most popular beaches of Pondicherry, Paradise Beach, Rocky Beach and Seaside Promenade beach. Promenade Beach is the pride of Puducherry along the Bay of Bengal. The 1.2km long stretch of beachfront has the major tourist attractions such as Le Cafe, Mahatma Gandhi statue, Dupleix Park, Promenade and War Memorial. Stay overnight at Le Pondey - Sea View Room. Morning after breakfast proceed for sightseeing visit Chunnambar Backwater in Pondicherry is a perfect picnic spot to unwind yourself, followed by Aurovillepavilion, Matrimandir, Botanical Garden and French War Memorial, Matrimandir - Matrimandir is the famous landmark of Pondicherry, situated at the centre of Auroville. The Matrimandir is a place for individual silent concentration and peace. Go to Aurobindo Ashram for inner peace, And then shop around ashram and walk towards AURO Beach. During the late afternoon and evenings you can roam around the city and visit these churches The Basilica of the Sacred Heart of Jesus, Immaculate Conception Cathedral and Eglise de notre Dame des Anges. Over night at Le Pondey- Sea View Room. Morning after breakfast drive to Chennai, the capital City of Tamil Nadu. Upon arrival Check into the Hotel. Rest of the day at leisure & Stay overnight at The Leela Palace - Sea View Room. Relax for a while and proceed for the afternoon sight seeing in CHENNAI which includes BESANT Nagar Beach, MARINA Beach, KAPALEESHWAR Temple, RAMAKRISHNA Temple etc.. Overnight stay at The Leela Palace -Sea View Room. Stay overnight at The Leela Palace - Sea View Room.